(May 25, 2011) Enjoy the Music.com, an industry leader in consumer electronics information plus equipment and music reviews for approximately 15 years, is pleased to announce our Best High End 2011 Munich event awards! With thousands of products showcased at the Munich High End Society event, only a small handful have been chosen as truly outstanding products. The Silbatone room receives an award for their new Reference 300 Silver Signature ($45,000) stereo integrated amplifier and is showcasing the 1928 Western Electric 16B wide range horn. The Reference 300 Silver Signature features a direct coupled circuit, 5965 as voltage amplifier and 5687 driver tubes aid the Western Electric 300B, with output being 8 wpc. The company uses their exclusive semi-silver nickel core output transformer, pure silver Litz wiring and Teflon circuit boards. The chassis is precision machined aluminum with an eye on shielding plus heat reduction and reducing unwanted vibrations. Harmonix receives an award for their new Combak Corporation Reimyo series KAP-777 stereo solid-state power amplifier. This unit employs a single MOSFET and creates 200 watt @ 8 Ohms (400 @ 4 Ohms) per channel. It is designed and manufactured through "High Tech Fusion", which is a technology cooperative program by four major audio and recording studio technology leaders. The "High Tech Fusion" includes accumulated knowledge of K2 technology, Recording Studio technology, their own traditional and Harmonix Resonance conditioning technologies. Cessaro hornspeakers earns an award for their Gamma I (�250,000) speaker's quality and modular design. The Cessaro Gamma is a five-way horn loudspeaker system with a modified TAD compression driver supertweeter, 1" TAD tweeter, 2" TAD compression driver plus eight back-loaded 16" TAD Alnico woofers. Gryphon Audio receives an award for their Pandora fully balanced two-chassis preamplifier (�24,000) and longstanding efforts in producing truly high-end audio products for over 25 years. The Pandora is a fully balanced design that uses a highly innovative rotary dial that has an industry leading 84 volume steps. YG Acoustics receives an award for their new Kipod II Signature speakers ($49,000) that has an innovative aluminum midrange and woofer cone. YG Acoustic's Kipod II has a deviation of a mere +/-1dB in the audible band and a phase accurate +/-5�. YG Acoustics' cones are produced in-house from a solid block of aluminum, with each driver starting its life as a sold block that is precision CNC machined down to size and shape. Boston Acoustics in combination with Ken Ishiwata receive an award for the Axperience floorstanding speaker. Ken Ishiwata's ability to design, tweak and implement products for the discerning music music are well-known as the man is virtually a living legend within the industry. The tweeter and midrange units float independent of the cabinet to ensure that undesirable resonance do not interfere with the driver's operation. 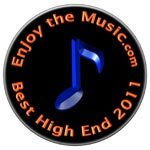 Being affiliated with four prominent print publications while also offering its own Review Magazine plus over 130 show reports online, Enjoy the Music.com is the leading Internet authority for diverse information serving both audiophiles and music lovers worldwide. Enjoy the Music.com is also the only specialty audio site with its own Internet browser, RSS feed, Android and Windows Phone 7 applications so their readership can easily find information they desire. Enjoy the Music.com is official Internet partners with The Absolute Sound, hi-fi+, Hi-Fi World, HIFICRITIC, Sound Practices and VALVE magazine.